Sicily presents a prime opportunity to experience cultural hybridization at its best and most beautiful. Due to its strategic location in the Mediterranean basin, the island of Sicily has been invaded over the centuries by many civilizations from the ancient Greeks and Romans to the Byzantines and Arabs and later to the Christian kings of Europe, each leaving a mark on the culture and traditions of the island inhabitants. This cultural and linguistic immersion experience will be based in the archeologically rich and elegant town of Taormina, considered an unmissable stop on the Grand Tours of the 19th centuries and since then visited by many important artists and filmmakers. 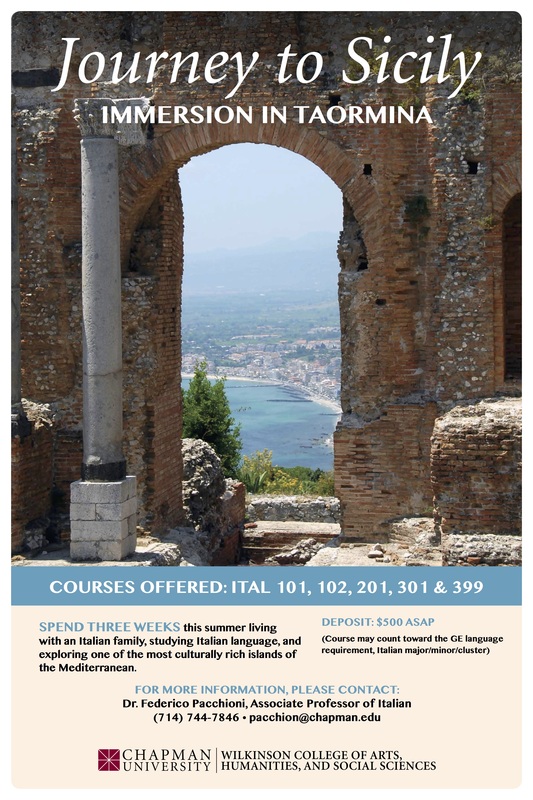 Students will engage in a rich curriculum integrating daily linguistic coursework, excursions to sites of naturalistic and artistic importance, and cultural activities familiarizing them with traditional and contemporary aspects of Sicilian life.